A pair while backpacking, one before getting snowed on and one before getting snowed on again. Water pours from a pipe from the dry hillside. 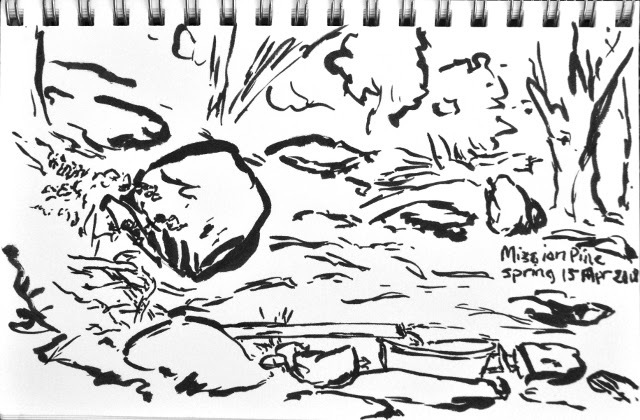 A sketch in the gathering gloom camping at Mission Pine Spring. The rocks for miles of White Ledge have quite interesting texture. 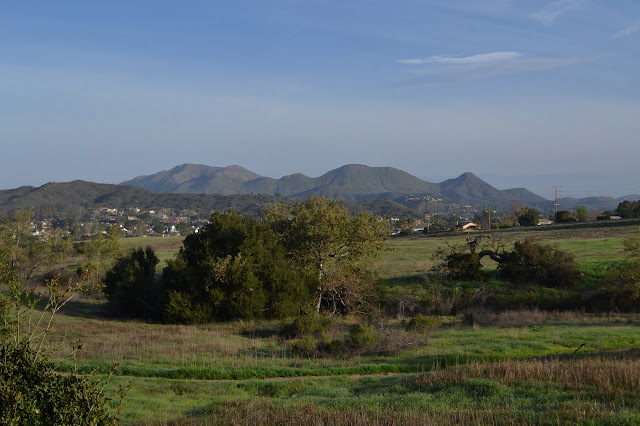 After missing one, I am out for another round of trails for the Conejo Open Space Challenge with geocahers. 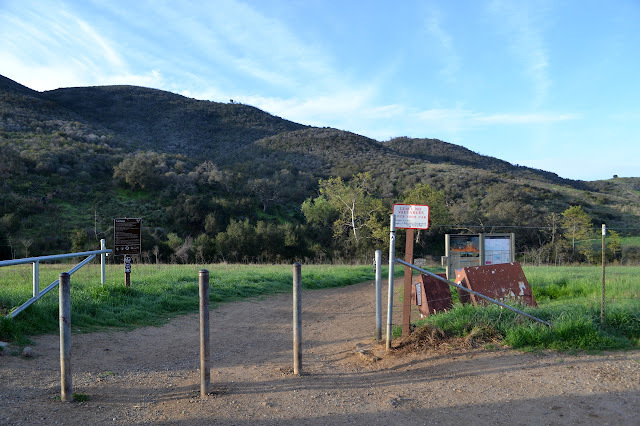 Today, our required trails are a pair of short pieces in the Conejo Canyons Open Space: Elliott Peak and Hawk Canyon. They are joined together with a long and elaborate loop that goes for an estimated 8 miles. I arrive a bit confused about where to start. We are only five strong today and Matt says I am in charge because I was the one doing the little bit of pushing to make sure everyone remembered there was a hike scheduled for the day, what it was, and determined a meeting time. (I did all that for the last one, too, and was not even going.) This is unfortunate because, as I say, I seem to be a bit confused about where the start is. I promptly compound it all and get somehow more confused and we go ahead and start down a different trail which will get us to our loop and does mean we have a nice parking lot to leave the cars. It has "do not leave valuables in cars" signs and everything. But it is definitely the wrong start. Oh, and I seem to only have the telephoto lens for the camera even though the normal, wider angle, one should be quite dry by now. This route is a mixture of utility road and trails. This entry makes it a little more road than the other entry would have been. We start off downhill, but that is the way of it from this area. We will just have to finish the day climbing. 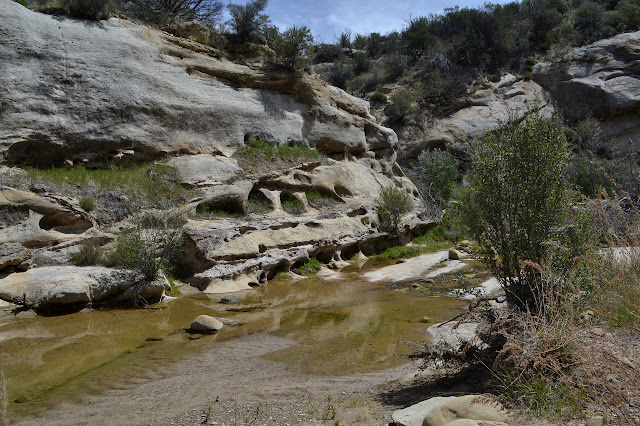 As we hit the bottom, we hit one end of Hawk Canyon, one of the required trails for the day. And after way too much discussion decide to leave it for later in the day since it is a nice, shady area. If the weatherman predicted well, we will not really be too worried about that, but it is so sunny that it is hard to believe it will remain cool all day. Many of the trails have no signs, but this one does. This goal for the day is put off to later. The other goal for the day, Elliott Peak, waits for later by necessity. 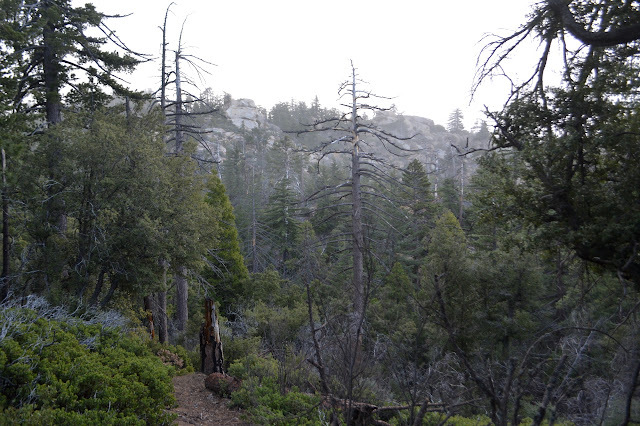 We turn up a trail to find it is part of our planned winding romp through the western plateau. Oh, and the mutiny starts (or would if we had a leader) as Matt takes the shorter route along the road saying it will all meet up again soon. Which is true. We relish getting off the road. Also, I had already had found the geocaches along the road, so it is nice to finally get to claim a find. 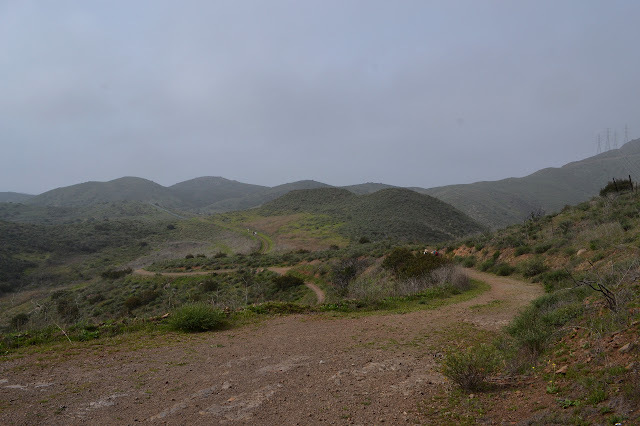 The adjacent Wildwood Regional Park across the canyon. I awoke in the dark to mist on my face. The night had been clear with bright stars shining where I could see through the leaves, but had turned dark. My light showed more mist coming down. It was raining. I could see quite a bit of water on my quilt already. It had been raining for a while. I looked around for some rocks to hold down the emergency blanket again and saw a blanket of white developing. It was actually snowing. The breezes of the evening had died to nothing and it was the most peaceful moment looking out on that fluff dropping down. And then I had to get up and deal with it. The emergency blanket is a lot easier to deploy a second time, so I got it open, got some rocks to hold it down, and tucked in underneath my rain coat to sleep the rest of the night away and get up to a blanket of white. 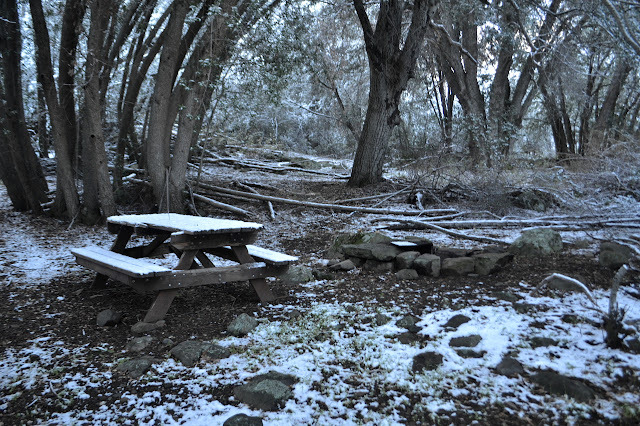 It is an all new camp in the snow and early morning light. There is not quite an inch to what has stuck of the snow. Not so bad. 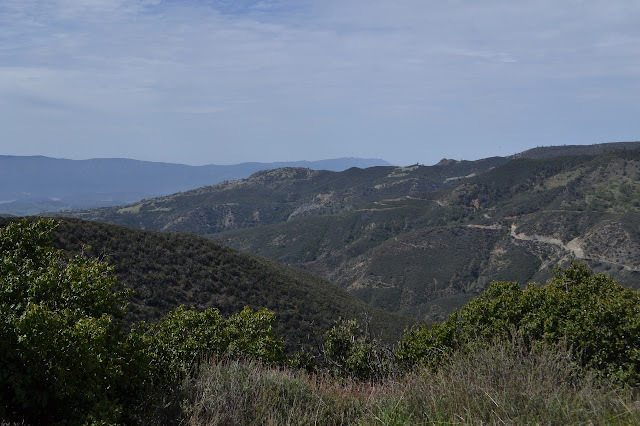 The thing is, today I get a little over a mile of trail that is new to me just like yesterday, only it climbs 1400 feet from this camp to the road above in 1.2 miles and it is rumored to be bushy and hard to navigate. 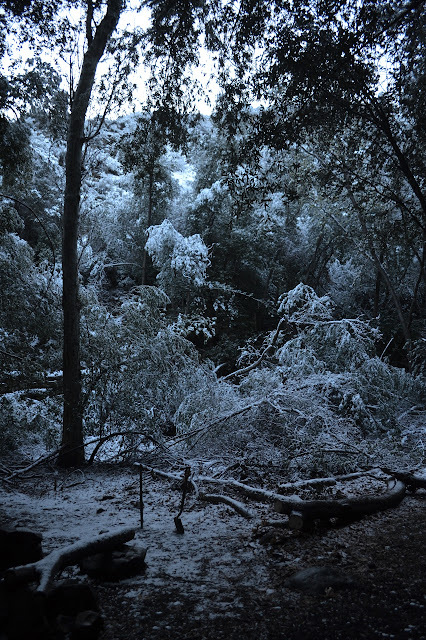 Now it is bushy, hard to navigate, and covered in what is likely to be an increasingly deep layer of snow. I set about breakfast, packing my wet gear, and admiring how the area that was all deep browns yesterday such that the iron sign was hard to see against the background of dirt, tree litter, and tree, is now a high contrast two color world. My feet are not yet wet, so I can appreciate that the snow is quite pretty. 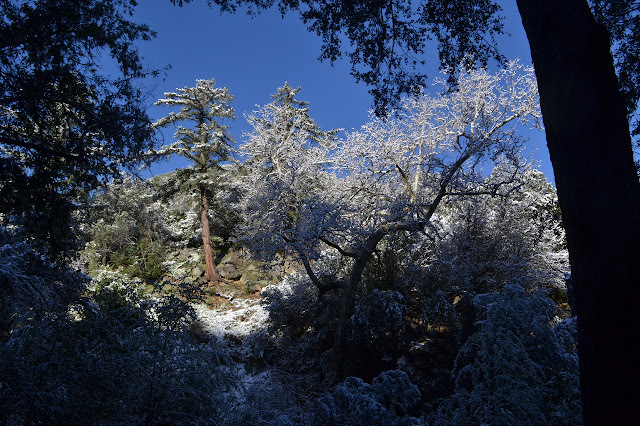 I head out on the trail where bay branches are hanging low with snow. A little encouragement with a stick gets them to pop up from chest height to overhead. There is soon a marker for the second site and I pause to check it out too. The table is a bit more solid, having never been hit by a tree and repaired. 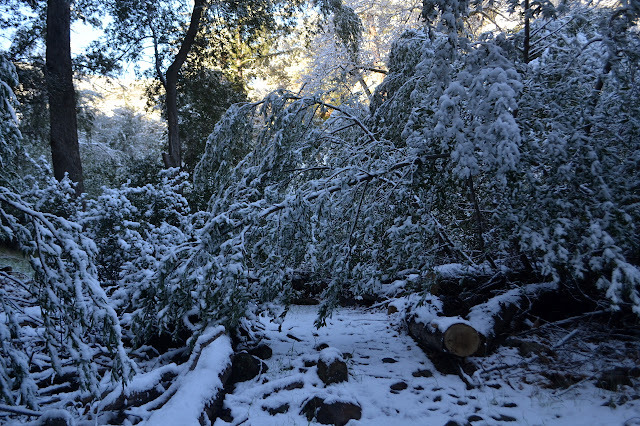 Just one of the many bay branches that drop down into the way when weighted down by snow. The upper camp at Big Cone Spruce with its better table. 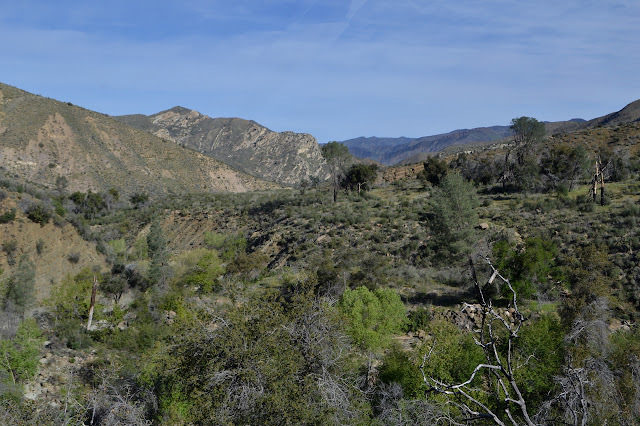 Soon I feel a time pressure from the sun as it creeps down the side of the canyon and into the upper reaches of the trees. I really better get going. This place is about to start to rain. I head back to the trail and up as it leaves the creek and climbs past the trees. I got cold in the night and being hatless, had to just grab the coat hood and pull it on my head. The rest of the coat spreading out over my shoulders was rather nice in the dark chill. The morning is clear and crisp. I will not be following a lot of new trail today, but there is some nice stuff to repeat. I wave to the folks at the cabin and head off along the trail. The junction marking the east end of the Manzana comes quick. 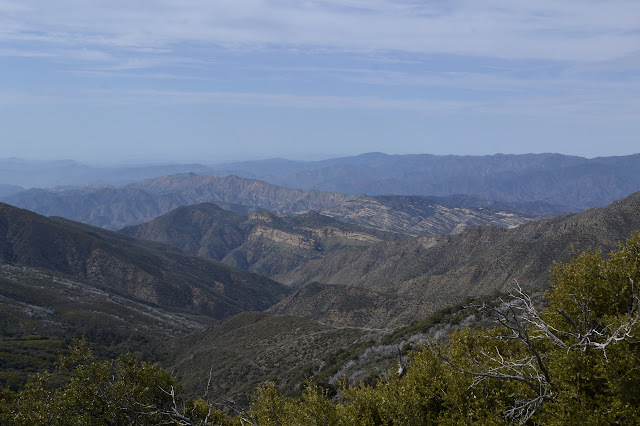 The rest of the Sisquoc would be new trail, at least down to the trail work a couple months ago, but is a little long added to getting up to Cachuma Saddle for just two nights of food. 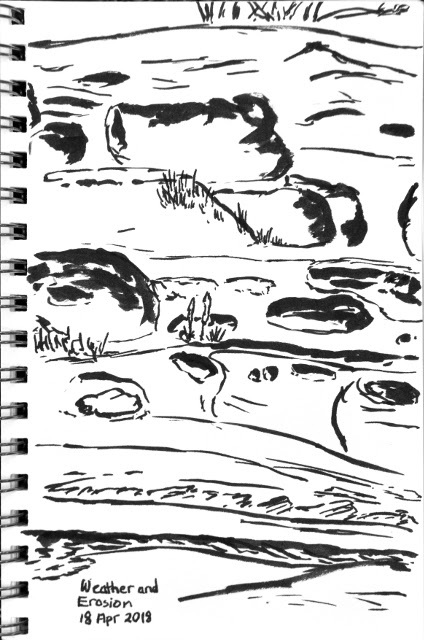 I turn up the Manzana as it climbs along the south fork of the river to Lonnie Davis Camp, a rather nice spot, and then then out into the high and dry. It is not nearly so dry as my on other visit. On the way up the south fork and looking back toward the cabin, which is not visible. And climbing into White Ledge Canyon a little higher. 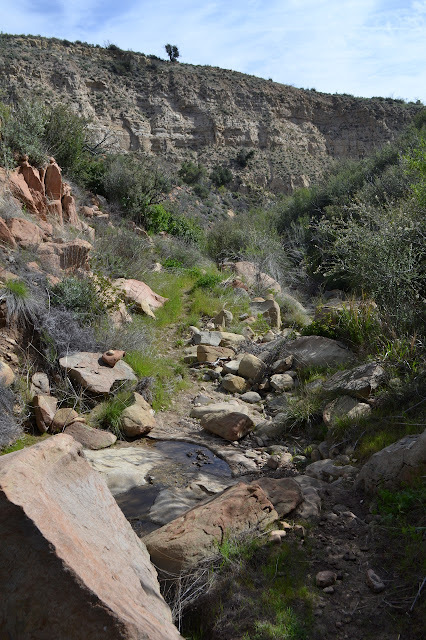 The trail climbs high on the south side of the canyon where a couple fairly dry tributaries cut deep into the soft substrate. In these spots, it drops suddenly to climb again steeply. Across the way, the steep walls are riddled with shallow caves and other carvings by water and weather past. Down in a side canyon. Water is thin, but running and pooling. 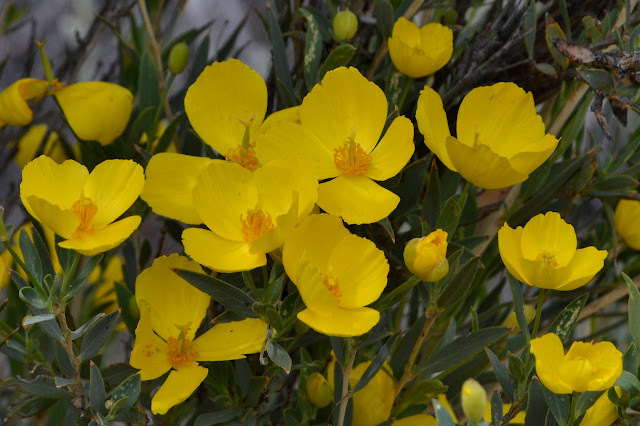 A few of the bush poppies are popping out with yellow all over as is expected. The night was not so bad as I feared it would be. There was a lot of room for it to be worse. As unprepared as I felt I was, I was mostly comfortable to be honest. There are ultralighters who probably think that means I have excessive gear. The wind could have easily challenged my setup and won during the night, but it stayed a breeze. We do not listen to that sort of person. While the emergency blanket probably kept in more moisture than it blocked, it also kept the wind from stealing my warmth. To show me just how bad having that warmth stolen is, my Platypus bags have a half inch shell of ice around the sides and my drinking tube is frozen quite solid. The first time I left it overnight in significantly freezing temperatures, I had the good sense to empty it first. For some reason I have not been able to remember to do so since then. The gloom and cold and threat of weather has not changed, so I experiment with just how much I can do still tightly tucked under my quilt. The pot lid is frozen onto my uneaten supper, so I put it on the stove and give it enough fuel to cook it (under usual circumstances) before nibbling at it again. My stomach accepts about 2/3 before getting a bit gurgly. The cooled remnants get stored away in the pudding container followed by the realization that I might have had some pudding first. Having a now clean pan means I can drink down some hot, sugary liquid instead. Now I have to decide if I really want to go up those mountains. I deeply suspect that it will be a visually stunning and cold day (followed by some more cloudy and wet as oscillation seems to be the established pattern of weather this year and the system will last until Friday) but very very cold. 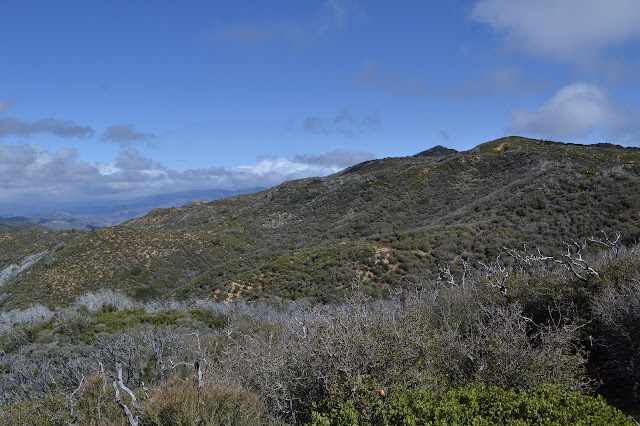 I just do not have the right gear for thrashing through the bush up Samon Peak in a cold wind. This really drives home the abuses I casually expect my rain or wind gear to go through. Instead, I could just head up and around missing the peaks. On the third hand, I could continue along the way I am going down to South Fork, which happens to be a descent day travel away and still have the old guard station. Ultimately, I decide to just go low and a little shorter miles. There are some aches and pains that are not vanishing with the evening rest the way I expect. The old cabin and original plan wins although I would have parked by NIRA if it was the plan when I started. I will just have to climb up Big Cone Spruce and down the road tomorrow. Decided, I put away my gear being careful with the emergency blanket that is likely to be needed again. 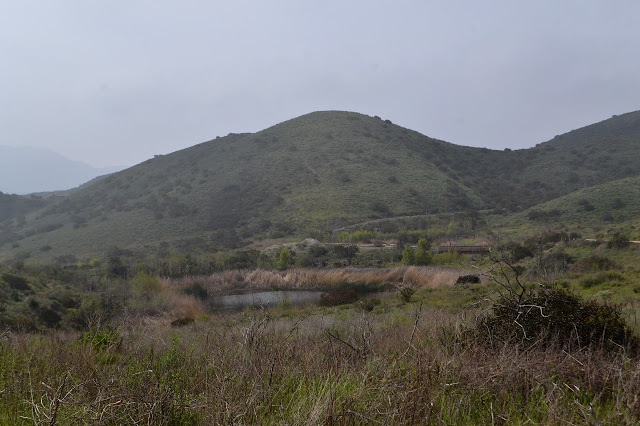 Dreary under the overcast sky and in the burn of the Zaca Fire. There are spots that are not quite so bad as this. There are lots of logs to step over, ceanothus to wander through, and ribbons to make sure I know which opening to aim for. 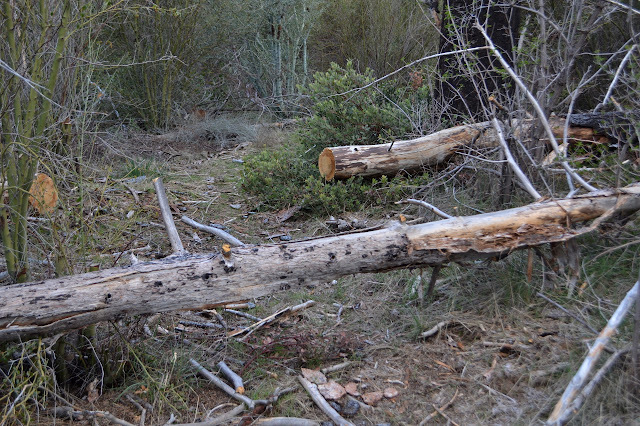 Coming to Bear Camp, AKA Lower Bear Camp, it looks like a death trap with the standing dead trees but it has a table. I am jealous. Logs, cut and to cut and ceanothus to scramble through. The thorny bush is not encroaching too much. There is a little more burned meadow to deal with before the canyon changes character into a tight and steep, earthy and rocky canyon. Gradually, there starts to be waterfalls. The trail along the slopes is thin and scary at times. Meanwhile, that frozen water tube is still frozen and I am getting a little bit thirsty. But waterfalls! Getting a look at them is a bit of a challenge, but they are there. 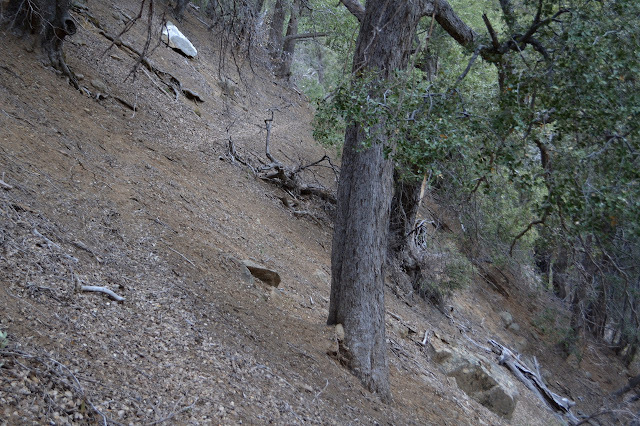 A thin trail along a steep slope where the oaks tilt out just a bit. Below, the water is still not dancing. It is just getting to where it can be noticed. Dead oak branches trying to obscure the waterfall below. My quilt got a little moist in the night, but there was a lot of visible moisture in the air yesterday. What did I expect? My sheltered spot is practically dry. There is a spot by the table that is downright soggy. Around behind the oaks beside me, there is a set of three standing dead and very tall pines and I am well inside their topple zone. Arg! Must be more careful with site selection. I get some breakfast and head out in a cloud. 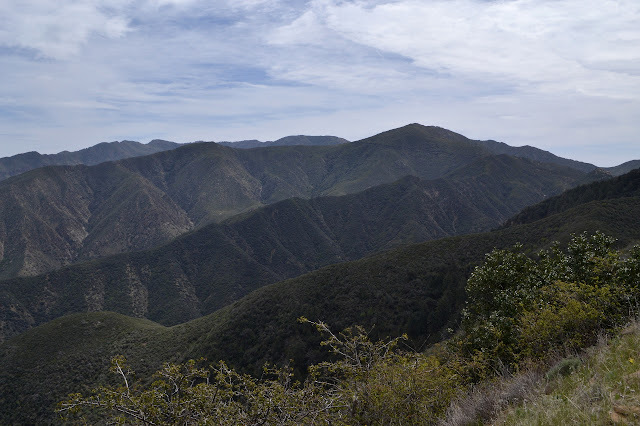 I have in mind to go climbing up what peakbagger calls "Peak 6080", but could sensibl called Mission Pine Mountain on my way out to West Big Pine and then to Upper Bear. This one is going to be a long day and I am not even sure how long. At least the uncertain portion comes early so I can try to make it up. Rocky outcrops are near but almost lost in the cloud. 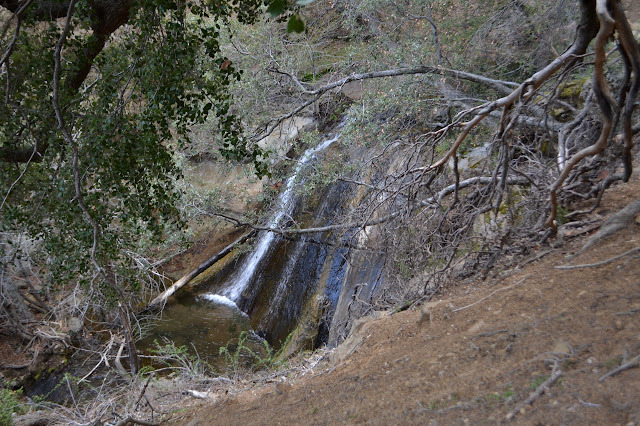 Just down the trail from camp is another stream that I am sure is also spring fed. There has always been at least some mud here when I passed. 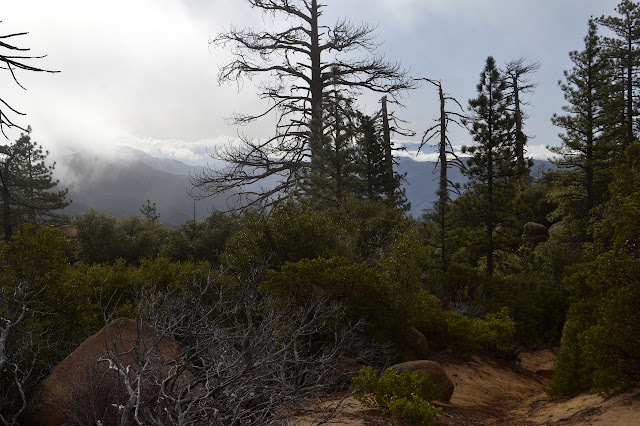 The clouds get thicker as I climb and descend on my way toward my break off point, just before a spot where the trail turns suddenly south. The view opens up in just the places I expect as the clouds burn off in the morning sun. Or maybe it is just that they are thin wisps hanging onto the mountains. The higher peaks are still enveloped in cloud. Getting just a bit of a view as the clouds clear off. Out toward the coast to the south. Everything has little puffs of cloud. As I get to my break off point, the GPS says the peak is 0.81 miles away. It was actually closer down lower, but I think I would rather follow a ridge line. My recollection of sparse manzanita for this area is not quite right. It is covered except where dead ones still occupy the space they possessed in life. It takes some picking to find a way through. At the top of a big, open gully, I see no way further keeping to the ridge. Gully it is. Steeply down, then a break in the brush to the side allows access to the next one over as this one becomes choked. The second gully is full of green bark ceanothus as it joins one off the next bump I want to cross, but this is actually not so bad to push through. The new gully is rocky as I head up it. There seem to be routes up out of it, and I take some with deer prints. Hopefully those go somewhere. I work one way and find a stop, then work another way. Working toward the peak quickly (in terms of distance, not so much in terms of time) starts to look hopeless. I still have 0.65 miles to go as the crow flies and I do not seem to be a crow. Oh, and whatever it takes to get back and the 10+ trail miles to camp. I turn back, just not wanting it enough. 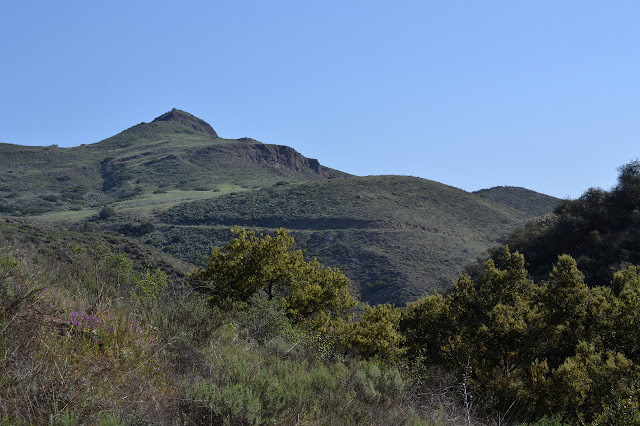 The peak I am calling Mission Pine Mountain is still over half a mile away. I believe it is the pointy one in the back. 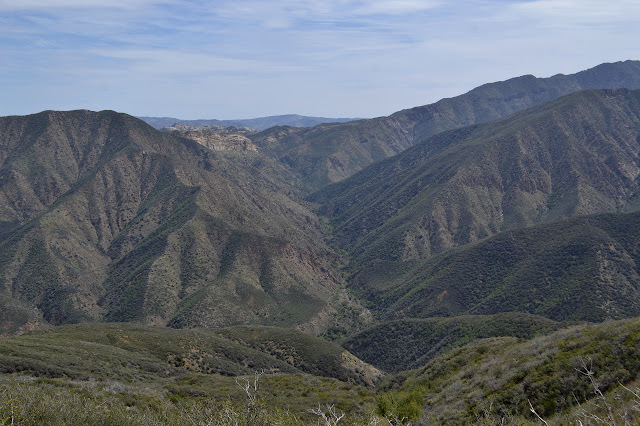 It is already nearly 10 AM as I arrive at Cachuma Saddle to start on 6 days of peak bagging and seeing new bits of the San Rafael Wilderness. I checked the Santa Ynez weather and it says it probably will not be too hot out here for those days. 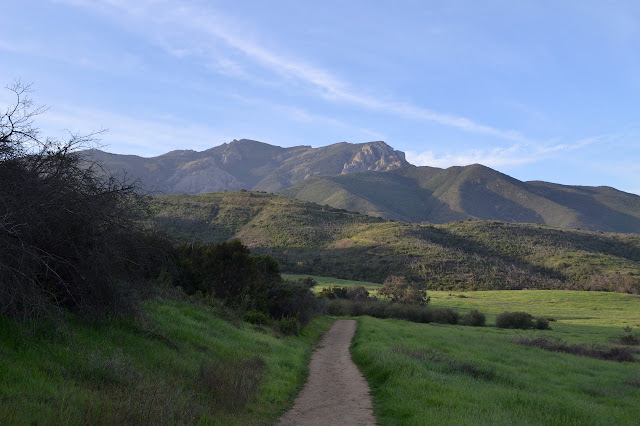 Assuming all goes well, I will finally finish off all the Hundred Peaks Section listed peaks for Santa Barbara County and get in an extra along the way. Some of the days are a bit long, but all the camps have good, reliable water. This bit is not new, which does not help when facing a lot of miles on a road. Still, there is good view, and it can be easy enough to think about that and ignore the rather stunningly wide nature of the trail. Sunny, but breezy and chilly, it is not quite time to try out my new sun sleeves and see how they are against the midday sun. 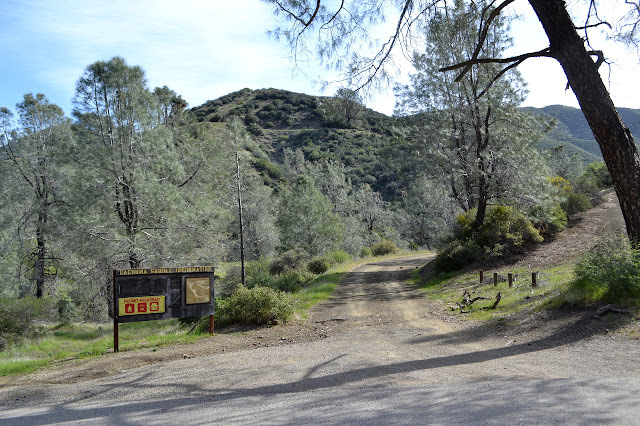 The old sign at Cachuma Saddle and the start of the road. This was paved for four miles and there was a guard station behind me when the map on the right was made. I expect to see a bit more purple from lupine this time of year across the canyon. 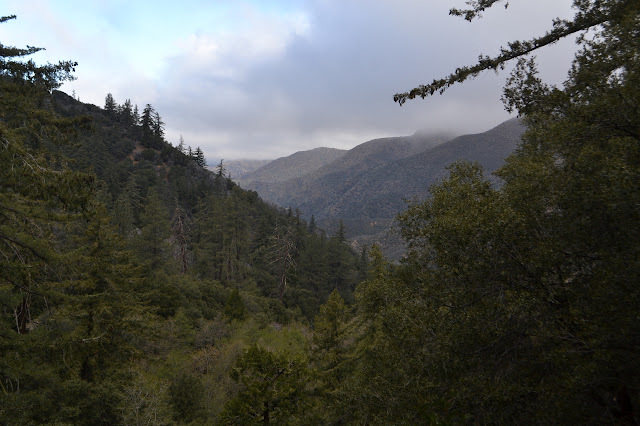 The valley of the Manzana Creek as it climbs up to the divide near White Ledge. The way ahead. 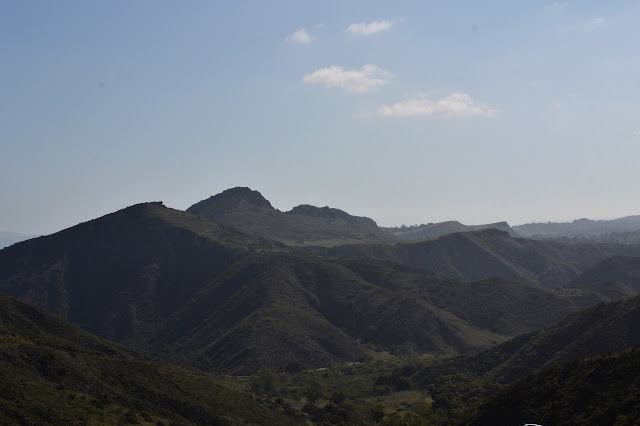 The road cuts around the side of McKinley Mountain with the bump of San Rafael Mountain behind it. Back not far from where I was hiking last week, I am out to either hike up to Tri Peaks again or take a big loop along the side of Boney Mountain. I probably should have chosen before starting, but I am still pondering. Although I want to go up to Tri Peaks again, I sort of want to do it via a different route than the one I have already done, so most likely this will be the larger loop to new spots. My start is new too. Previously, I started from by the cultural center, which has parking behind a gate that locks at sunset giving an annoying deadline for getting back. This time I am using the trail at the end of Windy Drive that everyone else seemed to be using so that I have no timing worries. Wide trail past informative signs to start off at the end of Windy Drive. The trailhead has a sign about fire inspired by the Springs Fire of 2013. 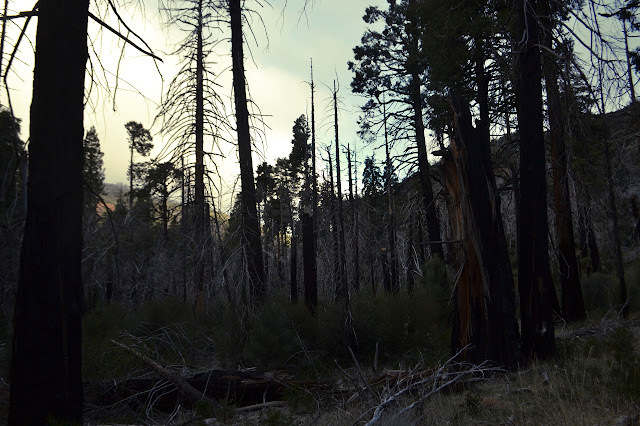 My previous trip was just 3 months after that fire, so this whole area was quite black. From here, loads of trails exist to choose from and I am not entirely sure which one I want to take. Toward Old Boney with a tendency to the right at first, then a left into the canyon will get me there, the first "there" being a little waterfall, and the exact trail does not matter so much. There are some very steep trails, one signed "no horses" and full of hoof marks in the dried mud, along the shortest route, the one I follow. Rabbits, with tails of white cotton, are still out and about as I go. There are a few poppies still twisted up tightly against the night. Conejo Mountain across the bit of city. 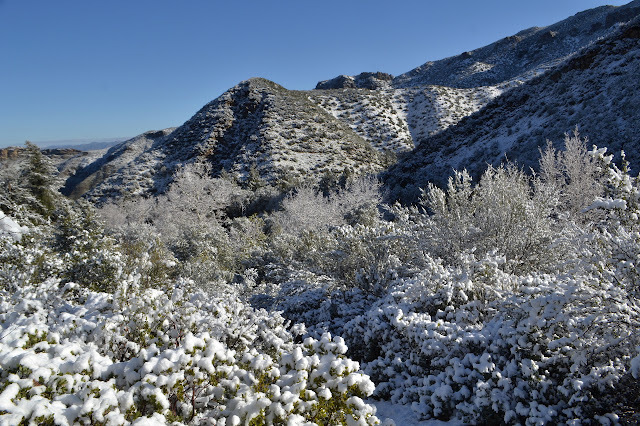 Boney Mountain in the morning light. My route does seem to be the shortest to get up the hills and into the canyon. 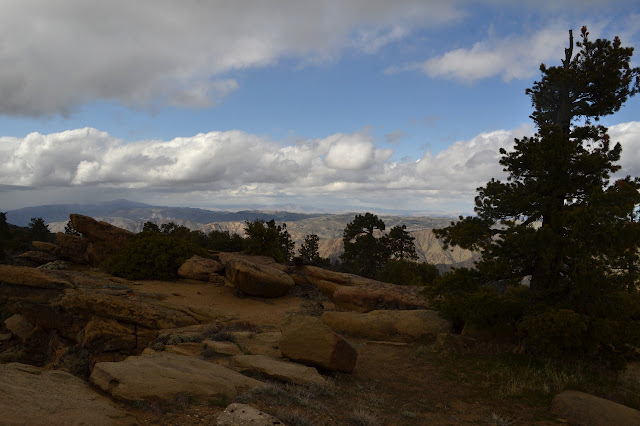 A trail to a lookout provides a brief temptation, but there should be enough hiking today. 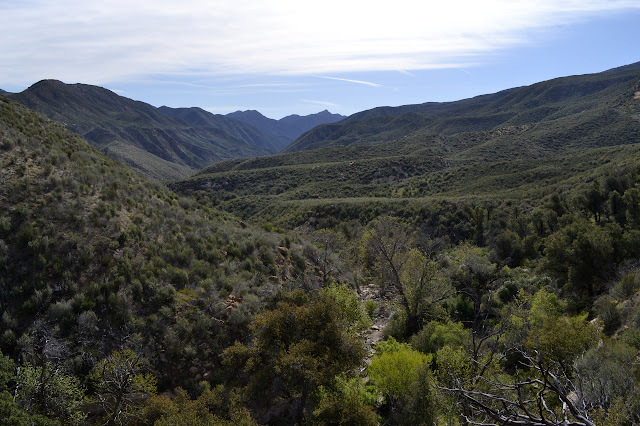 The sound of water below is unmistakable once I take that left turn and start down into the canyon. There should be flowing water in the waterfall today. 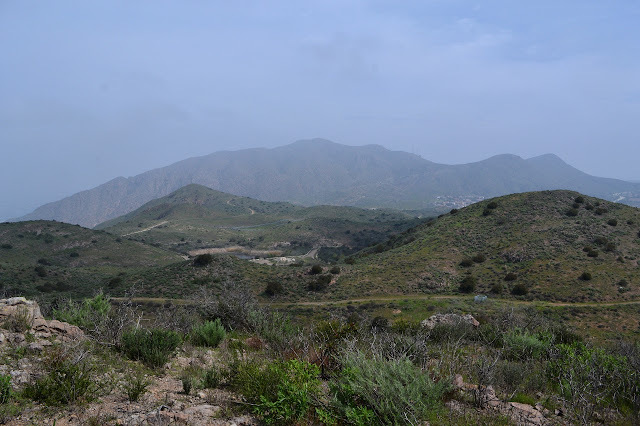 For the third (only the second for me) COSCA Challenge related geocaching hike, we have two required trails planned: Vista Del Mar and Prickly Pear. 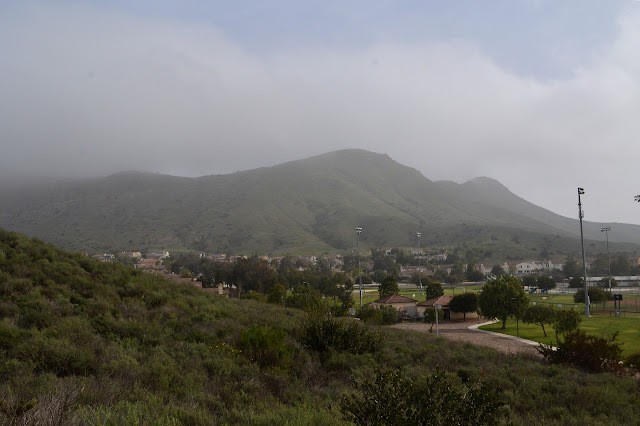 The main streets in the areas do not allow parking and most side streets seem to be gated, so we met at Dos Vientos Community Park, where there is quite a lot of parking. I had thought that this would be high enough and far enough from the beach to get out of the coastal gloom that has recently closed in, but no such luck. The area is socked in. There is a little lifting as we wait for the start time, but not enough to see the little mountain peak. Due to the holiday, there are only five total once start time rolls around. We take off across the park, somewhat uncertain as to where the trail is exactly. It sorts itself out easily enough as we get into the right area and we start up Park View Trail. The foggy hills across the park. 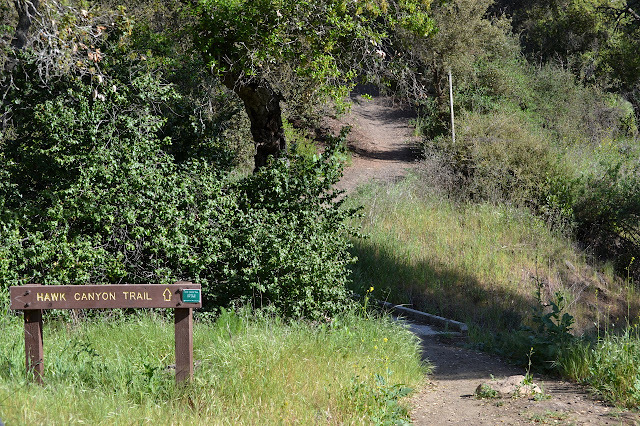 There is no sign as the trail splits. 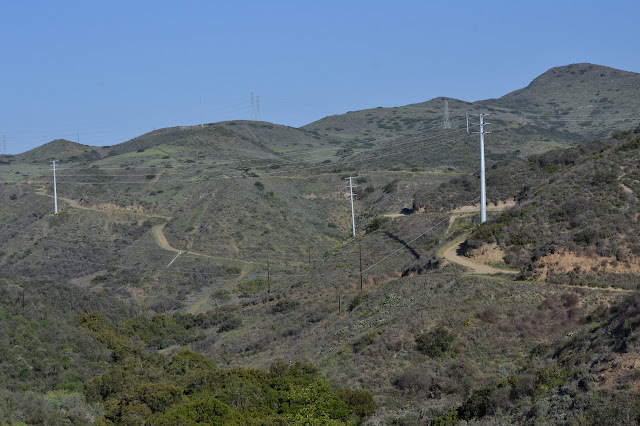 The right goes off to Powerline Trail and the left to Vista Del Mar. We follow the left as that is our required trail. It starts as we cross over a road and into the next patch of open space. This one is a bit bigger. The trail quickly gets bigger too. There is a spur to get up higher, and we take it to try to find the puzzle cache up there. For this one, we have to line up the photos to find where they were taken. The fog is just lifted enough to do that. Still no distant views before we head down and continue on our loop. A segment of Edison road makes up some of the path. It is a wide route with easy hills. As we approach the pair of lakes, it becomes obvious that one among us is a bird watcher as well. I follow the line of the binoculars to see a bit of black at the top of a reed. Probably a red winged blackbird. There are also some non-mallard ducks among the more easily discovered birds. A moment more of looking shows a few more darting among the plants surrounding the water. Until recently, the lakes were dry, so there might not be as many as there could be. The first of the pair of lakes. Well, really ponds.